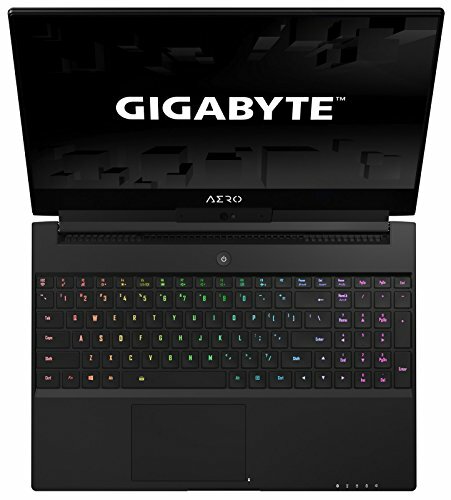 Gigabyte’s Aero range has always attempted to bring premium gaming tech to the ultrabook form factor, and this refreshed Aero 15 is no different. Bringing together a 15.6-inch Pantone colour certified screen, full-sized keyboard, dedicated Nvidia GPU and a 94 Whr Li-Ion battery then squeezing it all into a tiny 35.6x25x1.9 cm form factor. Combine this with one of Intel’s new 8th-generation mobile CPUs, 16GB of DDR4 RAM and a 512GB SSD and you have a cutting-edge gaming PC that slyly takes the shape of a professional ultrabook. 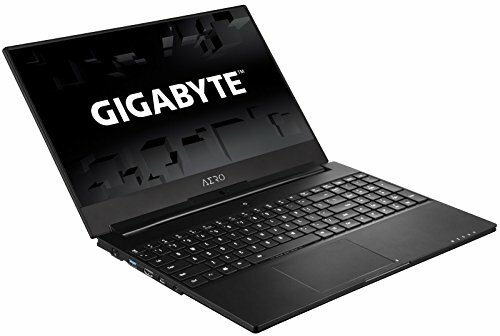 While the Gigabyte Aero 15 may look like it’s intended for lighter workloads, it packs a number of powerful components into its compact chassis. Squeezing these expensive parts into such a small form factor adds additional spatial and thermal engineering costs to an already expensive spec sheet. 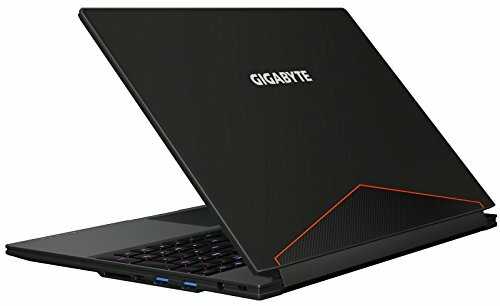 The Nvidia GeForce GTX 1060 GPU configuration, but you can optionally step up to a more efficient GTX 1070 Max-Q GPU, or opt for a 4K screen and an NVMe SSD for the same price. 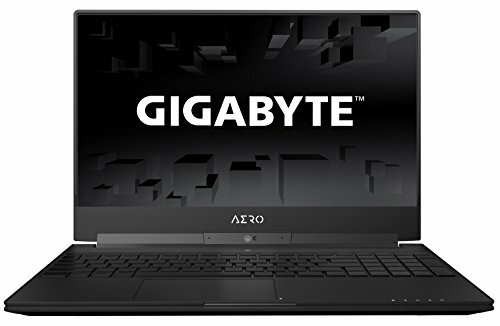 The design of the Aero 15 is largely governed by the fact that its 15.6-inch screen has been packed into a 14-inch laptop body. While that’s appealing, it also creates hurdles you have to be willing to overlook. The display, for example, only has 5mm bezels around the top and sides, but there’s no space for the webcam at the top of the screen, forcing it to drop to the bottom near the the hinge, something that isn’t ideal. It also makes the bottom bezel bulkier than it needs to be. While the Aero 15’s keyboard includes a number pad, it suffers from the same space constraints as the screen, with the keys filling the frame and sitting just a hairline away from the body edge. With that limited space there’s no gap between the keyboard proper and the number pad and the two have been melded together in a way that abbreviates the right [Shift] key, and gives you little room for error on the [Backspace] and [Enter] keys. It’s not a deal-breaker, but is something that’ll irk initially. 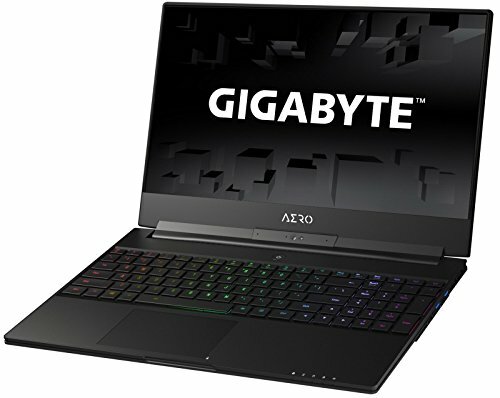 It’s worth looking at the Aero 15 design from a broader perspective, however, as there aren’t any other laptop vendors that’ll give you a gaming-grade laptop with a 15-inch screen and a full number pad in a 1.8cm thick chassis. And while the unit weighs a little over 2kg, for something with this much power and battery life, it’s exceptionally light. 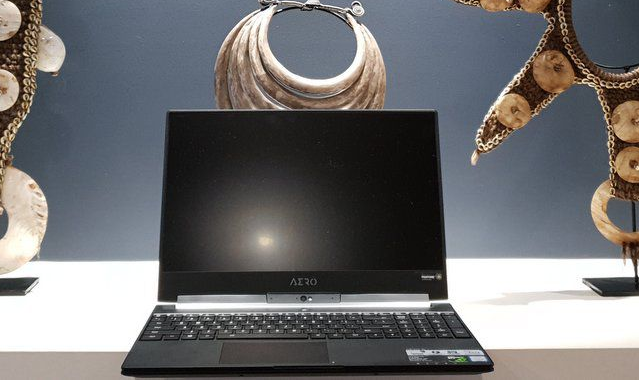 It doesn’t skimp on materials either with a carbon fibre embellishment on the top of the Aero 15’s premium metallic shell. That appeal flows into the silky smooth trackpad that’s one of the most responsive we’ve tested, and while the keyboard is a little constrained, it otherwise comprises pleasant-feeling keys with powdery matte keycaps and deep travel. responsiveness. Plus its Pantone colour calibration means it’ll work well as a design tool. 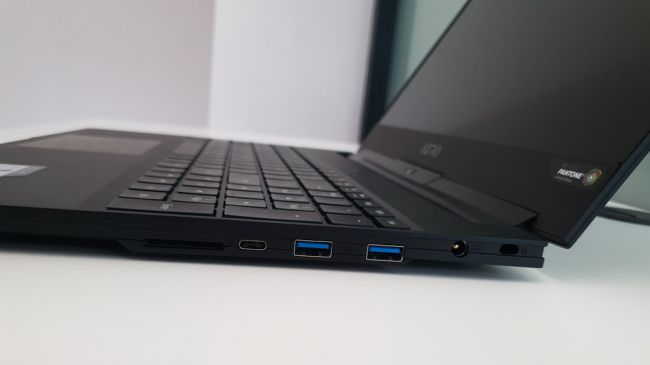 Adding to its long list of positives is one of the most comprehensive sets of ports we’ve seen on an ultrabook in a long time. Not only do you get HDMI 2.0, two Type-A USB 3.1 Gen 1, a Type-A USB 3.1 Gen 2, Ethernet and a 3.5mm audio combo connection, there’s also a UHS-II 500MB/S microSD card slot, a Thunderbolt 3 USB Type-C port and an additional mini-DisplayPort 1.4. With a six-core mobile CPU from Intel onboard, the Aero 15 cuts an impressive swathe through our CPU-intensive benchmarks. 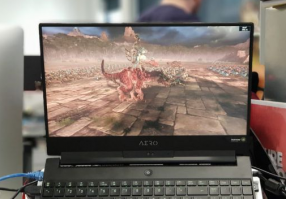 Take the raw CPU scores from Cinebench’s R15 benchmark and you’ll see that, on single-core tests, this laptop’s new Core i7-8750H CPU scores only a little better than its i7-7700HQ predecessor on the Asus ROG Zephyrus, with the Aero 15 getting 156 to the Asus’ score of 149. This five percent per-core boost translates into a 17.4 percent overall boost in multi-threaded CPU benchmarks when using Windows’ ‘Balanced’ power mode. The Aero 15 can be pushed considerably further, however, by putting it into Performance mode, which pushes its multi-threaded score up from 861 to 1,125, putting it 53.5 percent ahead of the Asus and close to desktop performance levels. Backing this up is a GeekBench multi-core score of 17,171 which puts it 12.6 percent ahead of the Dell XPS 13. With general tasks, the Aero 15 achieves impressive results too, getting 4,460 and 5,635 in the respective Home (accelerated) and Work (accelerated) PCMark 8 benchmarks, which means it powers through tasks better than any previous laptop we’ve tested with 16GB of RAM to date. While the Aero 15 has generous GPU power for a professional ultra-portable, the Nvidia GeForce GTX 1060 model is middle of the road when it comes to gaming performance. It’ll get close to 60fps on most early-2017 games using Ultra settings at 1080p resolution. Turn down those graphical settings a little however, or play older titles, and you’ll really be able to put that 144Hz screen to use, with less- demanding titles often pumping out 100-plus frames per second. The Aero’s GTX 1060 more than holds its own as a gaming GPU that’ll handle anything you throw at it, as long as you don’t need to have every graphical bell and whistle turned up to the max. 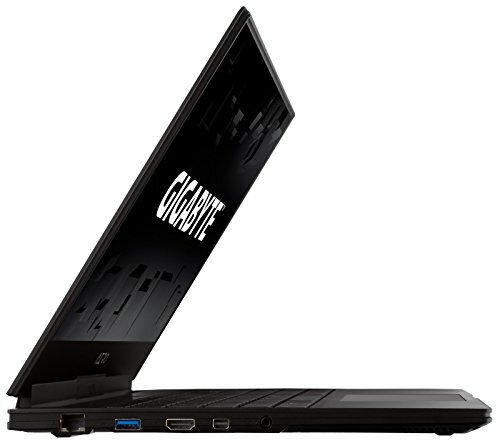 Gigabyte’s initial Aero 15 broke a lot of new ground in its pursuit of squeezing a fully-featured 15-inch laptop into a 14-inch form factor, and this year’s upgrade has improved on the original. 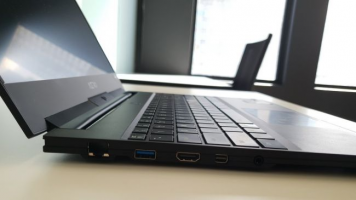 Packing one of Intel’s eighth-gen mobile CPUs means the Aero 15 is able to harness considerable performance boosts, making this a beast of a machine for intensive multimedia work. 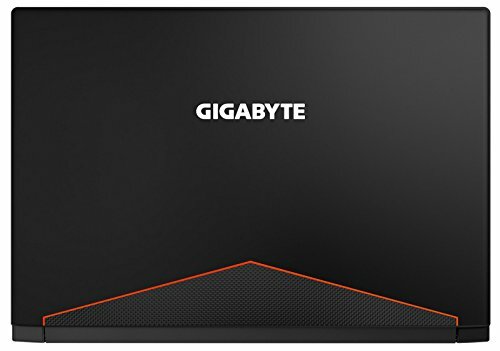 Gigabyte has also optimised the battery life, enabling it to get over seven hours of movie playback in Performance mode, a result that should translate to nearly a full working day of general usage, even when you mix in some of some of those multimedia tasks. A slim and light laptop that packs considerable punch, only design constraints let it down a little. Packs powerful components into a slim 14-inch chassis for a neat balance of work and play. 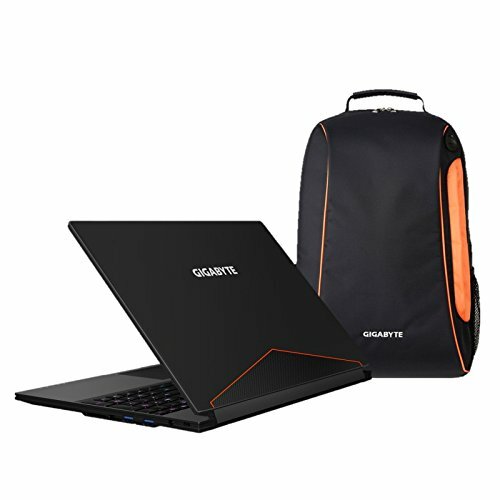 *PROMOTION: Exclusive Gaming Bundle ($60 value). See description for more details.